Researchers have solved a key obstacle in creating the underlying technology for miniature optical sensors to detect chemicals and biological compounds, high-precision spectroscopy, ultra-stable microwave sources and optical communications systems that transmit greater volumes of information with better quality. A research team at Purdue Univ. has demonstrated prototypes, and new findings are described in a paper appearing online in Nature Photonics. The findings, together with those in another paper published in Laser and Photonics Reviews, detail an optical phenomenon called “dark pulses” and show how to precisely control the comb generation. “Say you have 40 channels. If we have 40 individual lasers, together with their individual control circuitry on a single telecommunication chip, then your cost is high. If one of the lasers goes down you have to replace the entire chip. You could achieve significant cost reduction if you were able to use just one laser to create multiple wavelengths to drive different channels,” he said. The lead author of the Nature Photonics paper is postdoctoral research associate Xiaoxiao Xue. The microresonators accumulate optical power, and enhance an otherwise weak effect of “optical nonlinear interaction,” which allows for the generation of numerous frequencies, Xue said. The ring-shaped device has a radius of about 100 micrometers, or the width of a sheet of paper, and is fabricated from silicon nitride, a material compatible with silicon material widely used for electronics. Researchers had previously created “bulk optics” systems, which use mirrors, lenses and other optical components arranged on a vibration-dampened table several feet long to convert and transmit the pulsed signals. However, these systems are far too large to be practical, and the Purdue researchers miniaturized the technology, creating microresonators small enough to fit on a computer chip. 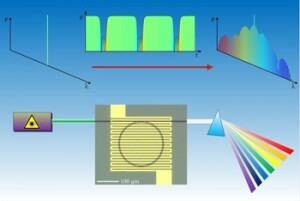 However, miniaturizing the apparatus poses challenges because it is difficult to retain a property of optical fiber called “anomalous dispersion,” which makes the high frequency components of a pulse travel faster than the lower ones, and was previously considered necessary to generate the frequency combs. Dark pulses can be envisioned as a shutter that is normally open to allow light to pass through, but can quickly close to block the light and then open again to turn the light back on. The entire process can be as fast as 1 to 2 picoseconds, almost 100 times faster than the switching speed of the fastest computer microprocessor now available. “If you had a comb you could probe molecules at multiple wavelengths at once, so it’s faster and provides more information about the molecule,” Xue said. Another potential application is as an “optical clock” for computers. Clocks are needed in computers to synchronize the operation of the billions of transistors in microprocessor chips. “Because of the miniaturization this could be applied to clock signal distribution to help improve the performance of computer chips and also for telecommunication systems,” Qi said. The technology also could be used in photonics-assisted processing of microwave signals, especially those with large bandwidth that are difficult to process using pure electronic methods.